PREMIER DIVISION: Last year’s Champions Preston Nomads top the Sussex Premier League after four games ahead of Cuckfield and East Grinstead following a three wicket win at Three Bridges. Cuckfield were heavily beaten at home to Hastings who won for the first time this season while East Grinstead enjoyed a massive margin in winning by 225 runs at Worthing. Horsham are within five points of the leaders who they meet at Fulking next Saturday, they won by 9 wickets at Roffey while Chichester moved off the bottom with a five wicket win at home to Brighton and Hove. Three Bridges were bowled out for 169 after being put in by Preston Nomads but it could have been much worse as they were, at one stage, 22 for 6. But Sohail Khan with 70 and Danny Alderman who made 45,improved the situation as Carl Simon tookm 4 for 60 and Owen Kernan 3 for 17. Nomads’ skipper Jeremy Green then made 66 not out to steer his side to a three wicket win at 171 for 7 as Mike Rose took 4 for 38 and Victor Davies 2 for 47. East Grinstead rattled up 334 for 5 declared at Worthing after being put in to bat, Australian newcomer Tim Davey hit 187 from 164 balls including 6 sixes and Sussex Academy youngster Fyn Hudson-Prentice made 51. Worthing then tumbled to 109 all out with Alex Harris making top score of 43 while, for Grinstead, Lewis Hatchett grabbed 3 for 45. Hastings owed much to Sussex youngster Harry Finch for their total of 208 for 4 declared at Cuckfield. Finch hit 116 and Jake Woolley made 40 in a total of 208 for 4 declared. Cuckfield saw Kevlav Maharah hit 55 and Jason Oates 58 but it was not enough and they were dismissed for 166 as veteran pace bowler John Morgan took 5 for 37. Horsham made short work of near neighbourS Roffey who they bowled out for just 145 as Michael Munday took 6 for 32, Craig Williams with 28 was top scorer for the home side. Horsham then cruised to 146 for 1 with 81 not out from Will Beer and 57 not out from Ben Shoare. Scores were low at Chichester where the home side moved off the bottom of the table with their first win of the season. Brighton and Hove were dismissed for 154 with Tim Jarvis hitting 71 as Aussie Ashton Turner took 3 for 56 and Matt Geffen 2 for 32. Chichester then reached 157 for 5 to earn full points with 68 not out from Turner and 41 from Chris Kirkham, Sussex Academy youngster Sam Grant took 3 for 19 on his Brighton debut. The two clubs relegated from the Premier League last season are the pacesetters so far this season with Eastbourne enjoying a record of winning all four games so far to heard Bexhill, 3 times winners, by 23 points with Goring 2 points further adrift after suffering a narrow defeat at home to local rivals Findon. Eastbourne were put in at the Saffrons by visiting Pulborough and were held to 175 for 9 as Toby Finzel made 59 and Dan Wells 37 as Pulborough skipper Lee Callaghan took 6 for 53. In reply Pulborough were dismissed for 142 with Imran Khan making top score of 59 as Mark Tomsett took 3 for 36 and David Twine 3 for 14. Bexhill enjoyed a four wicket win at home to Glynde after putting their opponents in and holding them to 222 for 7 of which skipper Dominic Shepheard made 72 not out and Chris Stanyard 62. Angus Cox then made 50 and Cameron Burgon 46 to take Bexhill to 224 for 6, Shepheard taking 3 for 63. It was tight at Goring where Findon won by four wickets with four balls to spare. Goring made 204 for 9 declared after being put in with 84 from Shane de Beer and 59 from Sam Thorns, Toby Kingsbury taking 5 for 49. Findon then won at 206 for 6 as Felix Jordan hit 77 not out and Andy Crossley 50. Ifield enjoyed a 29 run win at Crowhurst Park despite being bowled out for just 116 after being put in by their hosts. Paul Brookes took 4 for 21. But the match winner was Clayton Caltsounis who took 7 for 17 to send the home side tumbling to 87 all out in 38.5 overs. Ansty remain top of Division 3 East though they were left hanging on with 9 wickets down after a tight draw at Haywards Heath. Haywards Heath collapsed from 58-0 to 165 all out as Glen Anson bagged 6-38, Sam Palser 3-44. Jonny Phelps top scored with 39 then took 4-40 as Ansty also collapsed, from 122-4 to finish 149-9. Leo Anderson was their chief run scorer with 48. Lindfield are in second 11 points behind after beating Keymer & Hassocks by 61 runs having posted 165-9. Burgess Hill thrashed Lewes Priory by 165 runs at Sussex University and lie in third place. Their 241-6 was mainly made up of 63 from Tom Trowbridge, 51 from Aaron Barnes and 47 from Jack Simpson. Simpson then took 3-14, Scott Wood 4-30 as Priory were 76 all out. Crawley won their first game of the season with Hellingly shot out for 68 after being asked to bat. Rhett Bridgens 5-19 and Adam Dallamore 5-47 sharing the wickets between them. Crawley were made to fight for the victory and lost 5 wickets in making the target. Adam Devlin taking 3-31 as Harry Chaudhary top scored with 33 on a difficult afternoon for the batsmen. Pagham’s excellent start to the season continues in Division 3 West with both their XIs having 100% records after four games. Pagham got home by just 2 wickets at home to Wisborough Green after overhauling the visitors 187-6. Billingshurst set Henfield 224 to win after Tim Weston blasted an unbeaten 101 in their innings. Graham Fuller took 4-55 but Henfield were well short at 168 despite 56 from Tony Brugnoli. Stirlands beat Crawley Eagles by 9 wickets to remain third. 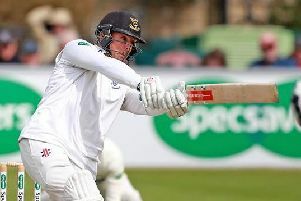 Ali’s 60 gave the visitors something to defend but Sean Heather and Will Gubbins were unbeaten with 116 and 63 respectively to hand the Eagles their first County League reverse. Steyning’s Andy Isaacs took 5-29 at Arundel as the home side could only reach 134. 49 from captain Dave Kennett then led Steyning to a 5 wicket win. Slinfold and Bognor Regis played out a draw with Regis 176-6 at stumps in reply to Bognor’s 186.